Illustration by Charles-Alexandre Lesueur, based on life-drawings made during Baudin's journey and specimens kept at Jardin des Plantes. The animals were thought to be a male and female of the same species, but are possibly Dromaius novaehollandiae baudinianus (left) and Dromaius novaehollandiae minor (right). Parker, S. A. (1984). 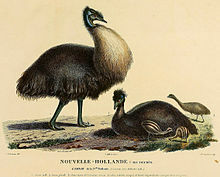 The extinct Kangaroo Island Emu, a hitherto-unrecognised species. Bulletin of the British Ornithologists' Club 104: 20.